The Arm’s Reach Co-Sleeper Bassinet is a unique creation that began with a mother and father’s need for a safe sleeping environment for their baby. They, like many parents, had rediscovered the benefits of co-sleeping with their infants—increased bonding, ease of feeding and a greater sense of closeness—yet were concerned modern beds weren’t appropriate for a baby’s space. They solved this problem by placing the child at the side of the bed, within arm’s reach. Their result is a wonderful series of bassinets that keep babies close to their parents during the important early months of development. Whether you choose to breast feed or bottle feed, the Co-Sleeper Bassinet promotes bonding and enables parents and infant to sleep better. It is also recommended by leading pediatricians and sleep research experts. Reach over and draw your baby close for feeding, or just plain loving. The Arm’s Reach Co-Sleeper family of products come in a wide selection of colors, fabrics and styles to harmonize with the décor of the parent’s bedroom. In order to provide baby with a complete sleep system, Arm’s Reach also offers the Co-Sleeper Beautiful Dreamer Cocoon, a suspended cradle environment much like that of the mother’s womb. It includes a gentle swinging motion to magically soothe your crying baby. 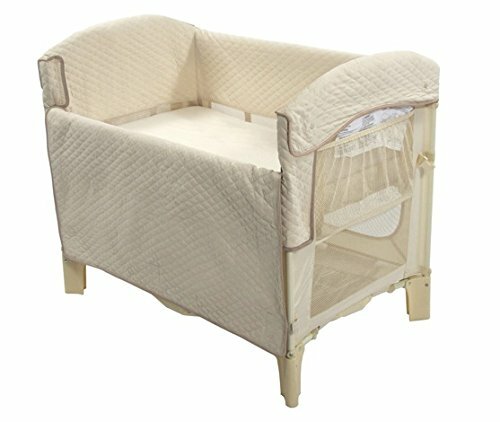 Use the Co-Sleeper Cocoon around the house by day and the Co-Sleeper Bassinet by night. If you have any questions about this product by Arm's Reach, contact us by completing and submitting the form below. If you are looking for a specif part number, please include it with your message.